There is no date set for this bundle so far but given the fact the game will hit soon I'm sure Microsoft will not want to wait for the best window of opportunity to close so it cant be long till it hits, this will be the ninth bundle to release in Europe and good ol Kotaku has what info is out about it. Kotaku.com reports: "Seven bundles? Oh, Microsoft Europe weren't ever going to stop at "just" seven 360 bundles for the holiday season. We knew that when the eighth one hit. And now definitely know it with the ninth bundle, this time in a Call of Duty flavour. 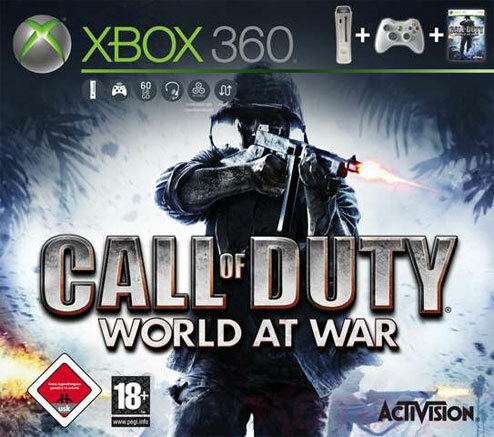 Included in the bundle is a 60GB Pro, a wireless controller and a copy of call of Duty: World At War. Not the most exciting bundle, then, but it's interesting to see an official pack-in of an adults-only game."